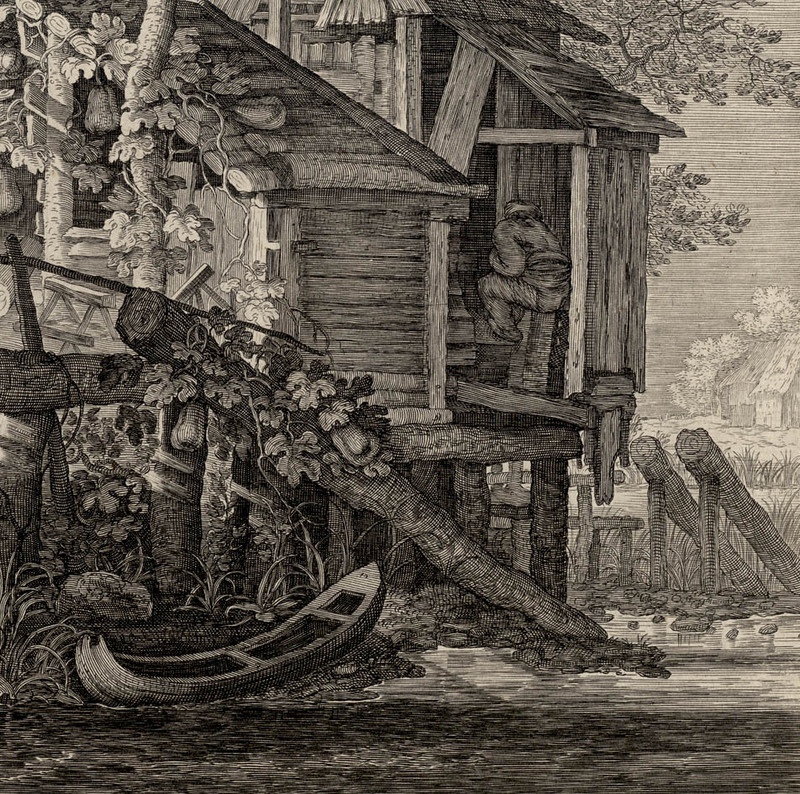 “Cottage on piles above a canal” (Cottage auf einem Hügel über einem Kanal), c.1610–13, from the series. 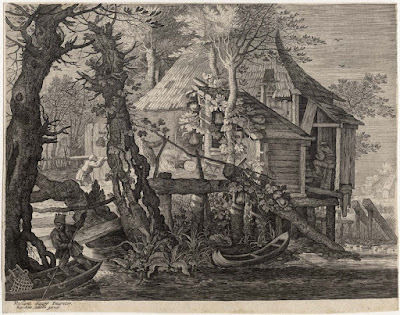 “SIx Landscapes”, after a lost drawing by Roelant Savery (aka Roelandt Savry; Roelant van Saverij) (1576–1639). 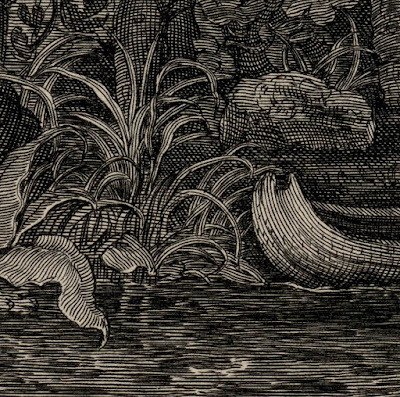 Isabelle de Ramaix in “The Illustrated Bartsch” vol. 72, Part 2 (Supplement), p. 36, advises that part of the series, “Six Landscapes”, may have been engraved by Isaac Major; see also Dorothy A Limouze 1990, “Aegidius Sadeler (c.1570–1629) Drawings, Prints and Art Theory”, Ph.D diss,, Princeton University, p. 196. 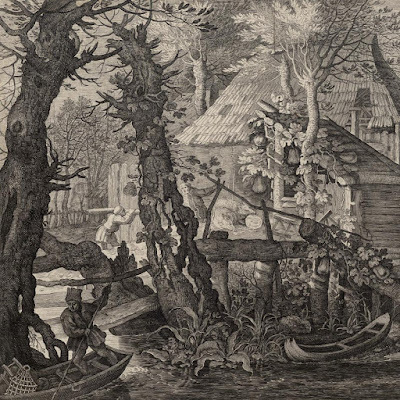 Interestingly, Limouze notes the influence of Gillis van Coninxloo on Roelant Savery’s drawings (p. 194). 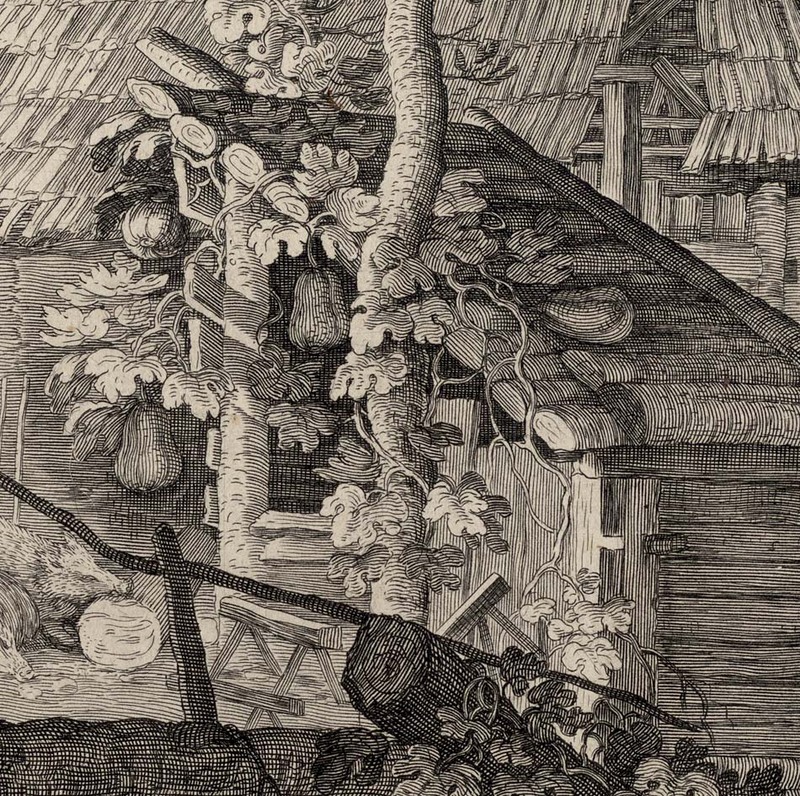 Etching and engraving on laid paper trimmed on, or within, the platemark, and lined on a conservator’s support sheet. Bartsch 7201.240 S1 (see vol. 72, Part 2, p. 39); Nagler 1835–52, no. 228; Le Blanc, nos. 204–09; Wurzbach, no. 106; Hollstein 1980, vol. 21, no. 232. Condition: exceptionally rare (this print is not even in the British Museum collection) richly inked and crisp impression, trimmed on, or within, the platemark and lined on a conservator’s support sheet. The support sheet must have been necessary as I can see a tear at the upper centre that is no longer an issue. Beyond this addressed issue the sheet is in excellent condition (i.e. there are no holes, abrasions, stains, folds or foxing). I am selling this superbly rich lifetime impression by Sadeler for a total cost of AU$389 (currently US$285.29/EUR269.77/GBP231.18 at the time of this listing) including postage and handling to anywhere in the world. If you are interested in purchasing this remarkable visual document of life on the canals in the Netherlands during the early 17th century, please contact me (oz_jim@printsandprinciples.com) and I will send you a PayPal invoice to make the payment easy. 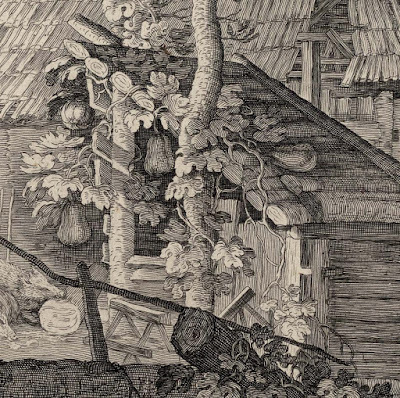 There is true art to sustaining a viewer’s interest and this scene of 17th century rural life exemplifies one way to hold a viewer’s attention. 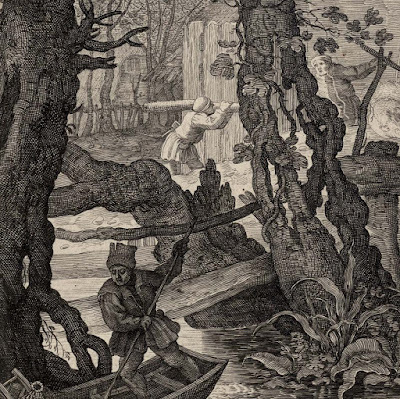 To explain what I mean by the approach employed, I wish to compare the compositional arrangement of this image to the way in which sentences are often constructed, in terms of using commas to frame key points. For example, if one starts reading the composition from the left to the right side, the two trees in the foreground isolate and pictorially frame the first glimpse of landscape populated with rural folk attending to their labours. In my reading of this first segment, I see that the angle of the slender punting pole held by the closer figure guides my eye to the task that another figure is undertaking in the distance: carrying a piece of lumber towards a partly obscured figure in the next segment framed again by trees. 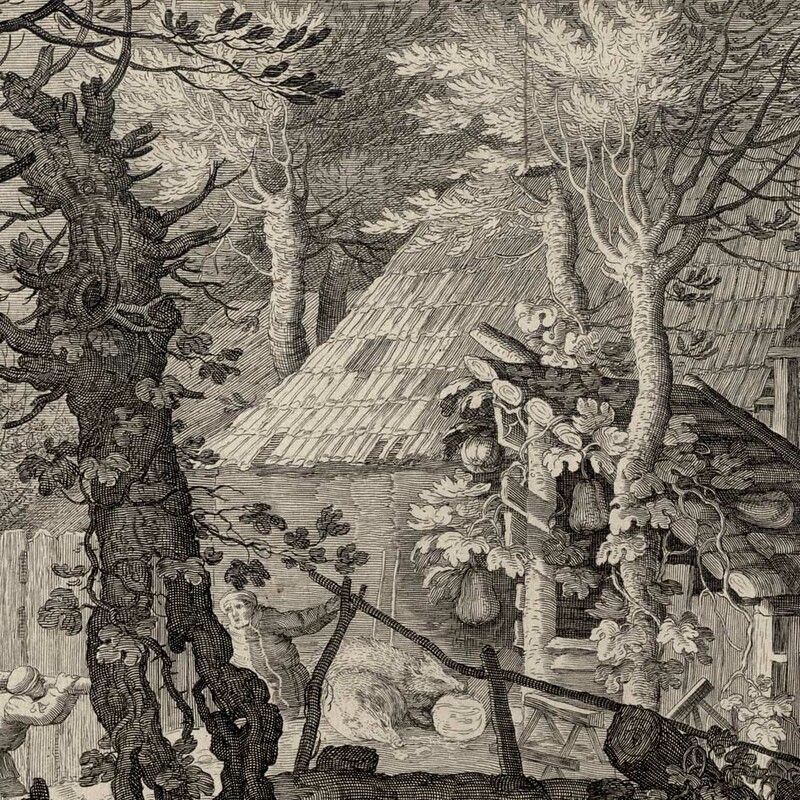 What I find fascinating to ponder is the skill with which the artists— Roelant Savery (designer) and Aegidius Sadeler (engraver)—have manipulated my reading of this image. Not only have they broken it into visually digestible portions from the left to the right sides, but they have also created a network of barriers and partial barriers to engage my interest by compelling me to navigate my way into the distance. For me, this is a wonderful image and it illustrates very well how visual semantics—framing ideas to communicate meaning—play a role in good composition.